, a French writer of more industry than genius, was born at St. Malu’s, in 1715. He entered for a time into the society of the Jesuits, where he taught the learned languages. Returning into the world, he was employed with Messrs. Freron and de la Porte, in some periodical publications. He was also a member of the literary and military society of Besangon, and of the academy at Angers. He died April 17, 1759, at the age of forty-four. Besides his periodical writings, he made himself known by several publications: 1. “An Abridgment of the History of England,” 3 vols. 12mo, which has the advantages of a chronological abridgment, without its dry ness. The narration is faithful, simple, and clear the style rather cold, but in general, pure, and of a good taste and the portraits drawn with accuracy yet the abridgment of the abbé Millet is generally preferred, as containing more original matter. 2 “Histoire des Conjurations et des Conspirations celebres,” 10 vols. 12 mo; an unequal compilation, but containing some interesting matters. 3, The two last volumes of the “Bibliotfaeque amusante.” 4. “L’Almanach des Beaux-Arts,” afterwards known by the title of te La France literaire.“He published a very imperfect sketch of it in 1752; but it has since been extended to several vols, 8vo. 5.” Memoires du Marquis de Choupes,“1753, 12mo. 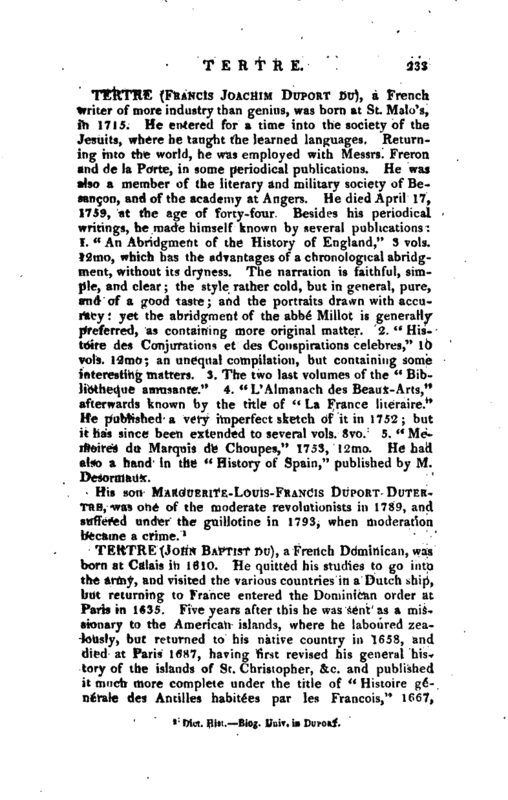 He had also a hand in the” History of Spain," published by M. Desormaux. Dict. Hist.—Biog. Univ. in Duport.